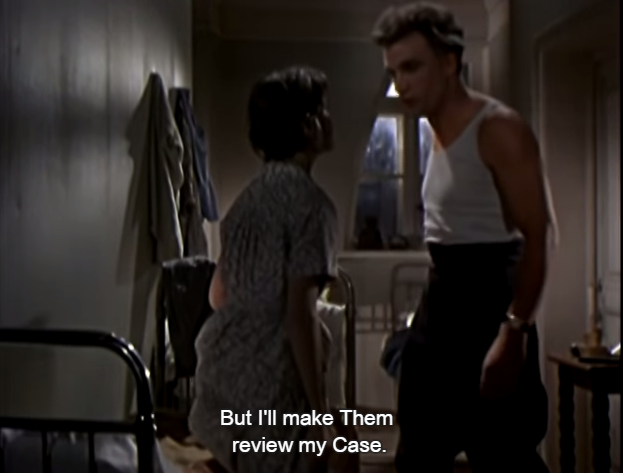 Because of the Cold War culture class I'm teaching this fall, I've been working my way through more Soviet films than usual. My favorite, if not the "best" of the lot? 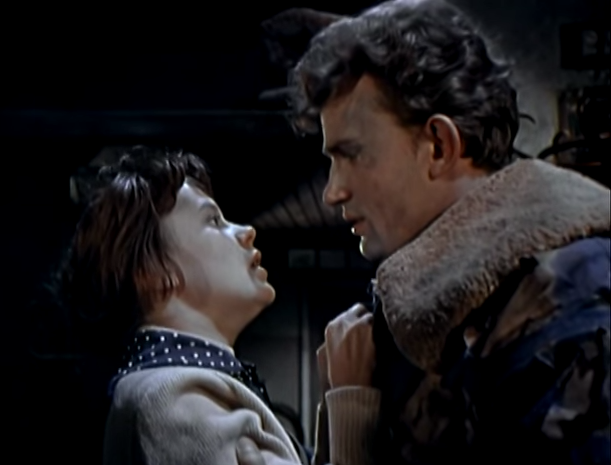 Clear Skies (1961): a love story between a military factory girl (Nina Drobysheva) and a pilot (Yevgeni Urbansky) during and after WW II. Beyond wartime romance, it gifts us with progressive concepts of marriage, a moving depiction of the returning POW's situation in Stalin's post-war regime, and a lot of carefully orchestrated histrionics. Clear Skies was a polarizing film, winning prestigious awards (it won against Chaudhvin Ka Chand and other international entries at The 2nd Moscow International Film Festival) and attracting harsh criticism (from U.S. appreciators of Dir. Chukhrai's previous work). 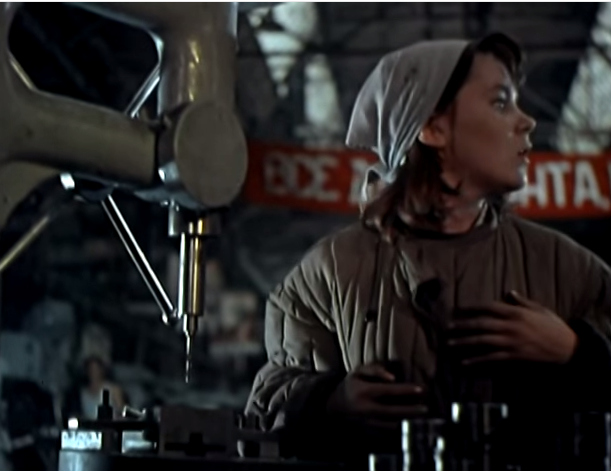 Aesthetically, this is exactly the kind of Soviet film that led me to my Soviet film hobby in the first place. 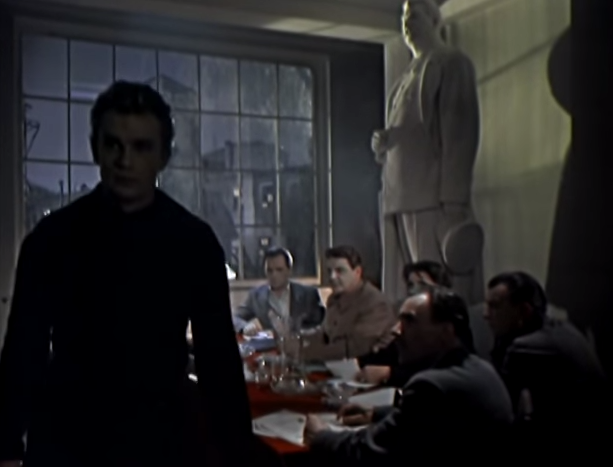 The colors are just right (and unique to Russian films of the '50s and '60s), and the rhythm of the story ebbs and flows symphonically. But, the most beautiful moments in this film are the personal ones. The moments of extreme loss or gain. Or, the poignant fallout of survival-driven decisions. There's a lot of beauty to be found in watching the shy protagonist grow from a girl to a woman, in her voice, movements, and face . . . so much so, that even without the help of aging makeup she is hardly recognizable by the end of film. Yes, the war changes her, but even more than that, this transformation is empowered by her on and off again relationship with the ace pilot . . . her refusal to get married to decent "seconds" even when her lover is presumed dead and she has a child to support . . . and her choice to stick with her husband during the years of his suspicion and blacklisting from the party. All of this makes Nina's character a person one comes to love and respect. For his part, Yevgeni Urbansky steals the film out from everyone else's feet, despite his syncopated presence in the narrative. He's an unforgettable performer, handling the quiet moments with *almost* as much care as the scenes of building emotional pressure. 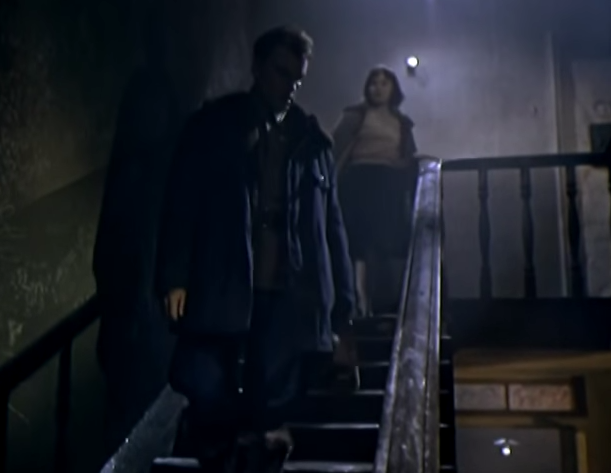 He also manages to keep in perfect step with the lead actress' transformative arc; managing to communicate a believable difference between the cocky flyer of the film's first half, and the slow-to-heal victim of the second. Tragically, Yevgeni died not long after this film released . . . an accident on a film set, it seems. 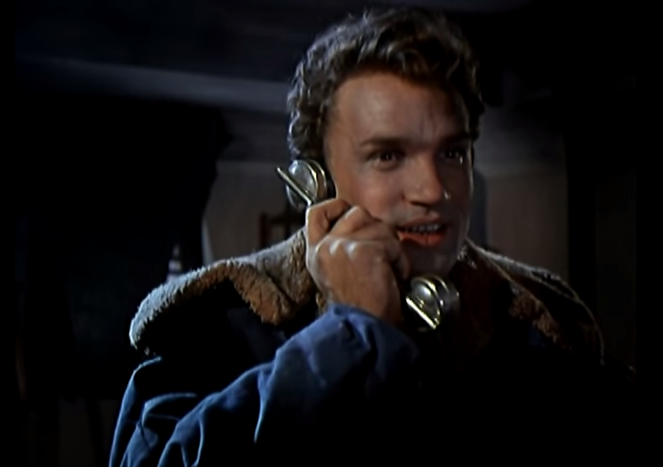 (Just watch him fell like ten trees on-camera in 1960's The Kommunist, and you'll get a decent sense for the risks he was willing to take as an actor.) Most of his (few) films are now considered classics, so it's truly fascinating to wonder what Soviet cinema would have become if he had lived. Of course, it's also possible his star would have faded along with the types of melodramas he excelled in. 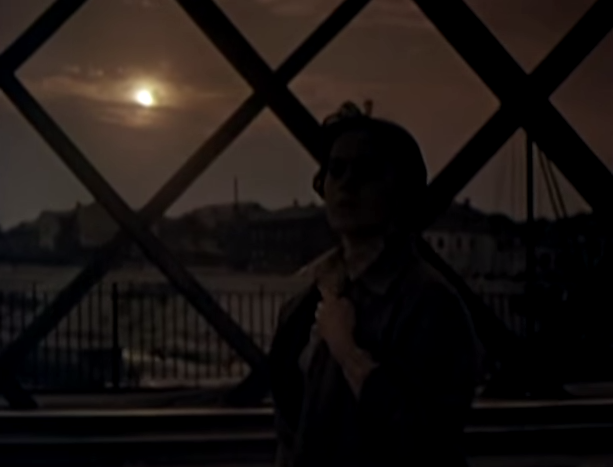 Despite it's status as a follow-up film to the much darling-ed Ballad of a Soldier (1959), you will not find "Clear Skies" in the Criterion Collection's half a dozen films (including BoaS) from this Soviet period. It's bright where you expect it be dark, happy when you expect it to be sad, and more concerned with the aftermath of war than you would expect a story "about an ace pilot" would be. Along with some similarities in subject matter and female POV, it shares the some of the technical bravery of "The Cranes are Flying" but with the added bonus (for me at least) of a lush Sovcolor palette (it's listed as "Magicolor," but I'm 90% sure this is from Agfacolor derived film stock). However, I'm sure everyone else, everywhere, would say that The Cranes are Flying is also a far superior film. In terms of technical perfection, I would agree with that assessment. But Clear Skies has something else going for it. Something you can't capture with protracted silence, tilted panning shots, or an elongated shadow on a wall. Optimism. This film has it. In spades. Me and optimism go way back, and I like optimism best when grafted to a story of love overcoming hardship. And, in case you were wondering, given the fact that this is Soviet-made, I really don't mind if some propaganda finds its way in to the mix. The more idealogical inspiration, the merrier. *It was meant to document an emotional story of war veterans and their families, not break all the rules of filmmaking for the sake of it. *It won't change all your preconceived notions about what a camera can do. It excels as an impressionistic portrait, not an abstract study. *Not everyone appreciates the "lesser" version of Technicolor (Sovcolor, a two-strip rather than three-strip developing process), either, although it is refreshingly different to those overused to Hollywood gloss and excess. It's also reminiscent of the earthy tones used in previous decades of Russian and Soviet art. *It is both a product and a celebration of the lessening of censorship under Khrushchev (even going so far as to present Stalin as a menacing figure), but it never pushes the bar too far. *Prescriptively, this is an emotional critique, NOT a political critique of a certain era of Soviet life. *Descriptively, it tells the story of the political persecution of believers, rather than dissenters. The main characters are all orthodox in their communist sentiments, but they are persecuted by the higher-ups in spite of that fact. Persecuted, but not destroyed, the film takes pains to tell us. *As you see in a lot of Hindi or Bengali romances of the time, the love story is a stand-in for bigger cultural problems and struggles ... and the triumph of the lovers over their "small problems" is also a triumph over the public's trauma and conflict. *Since it aims to inspire, be sure that ideals WILL trump reality in the end. But honestly, those looking for an easy, high-culture-friendly "art film" should go elsewhere. The generally harsh reactions to this film (by the same people who love similar Soviet fare) once again betrays the "elite" film-goer's tendency to misunderstand melodramas. Or at least those that can't be excused as a technical achievement, and/or happen to be melodramas released after 1955 . . . outside of the U.S. But, come ON, cinephiles. Melodramas are just as important as dramas (and, of course, the line between them is very fine indeed), and this one is told better than most. If it's Gone With the Wind, or a similar throwback to a fantastical history that never happened, people will flock to support hyper-magnified expressions of war, love, or survival. But if it's a film like Clear Skies, which actually fulfills the need for [then] contemporary stories and contemporary catharsis, not so much. The fact that Clear Skies dares to be intense AND hopeful doesn't make it "less" of a cinematic achievement. Not all the important stories are the cynical ones. 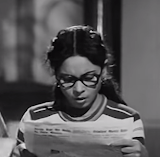 'Course, if you watch Hindi films, you already knew that.